Cook at Home Paella is always willing to help the community. We are happy to let schools and related cultural events borrow our equipment free of charge and provide all the help you need to create the perfect Paella, as we offer instructions on how to cook it. As most schools can source ingredients from local sponsors this becomes a very effective way of making money for your school/charitable trust. Our giant 200+ Person Pan, plus our 50 Person Pan was in action at their fundraiser. 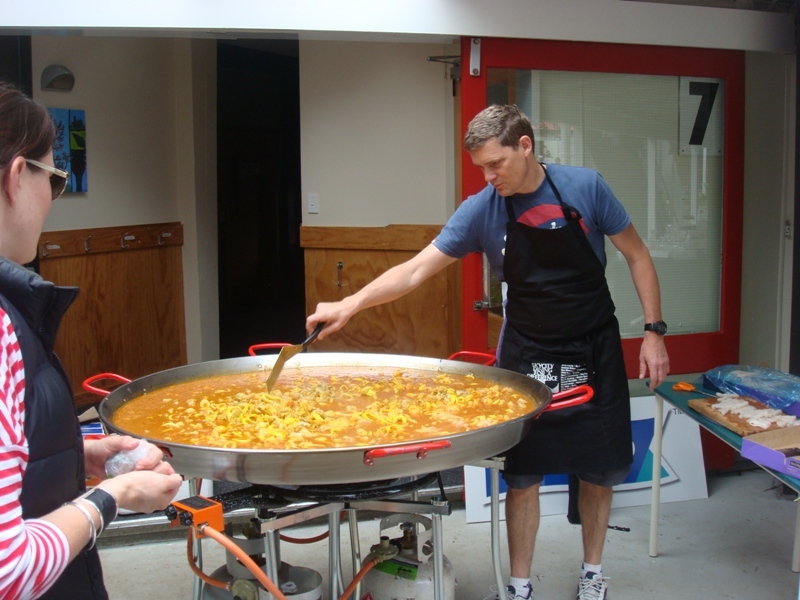 Just a quick note to pass on a massive thanks for the use of the paella pan at our Steiner fundraiser. The night was a great success, we managed to raise a decent amount and best of all the food was a hit. Its great to see a company supporting the community like this and we are all very grateful for your support. We gave up our time and equipment to cook and provide an insight into Spanish cooking for 80 students who were taking a closer look at the Spanish Culture. I wanted to thank you ever so much for the amazing experience you enabled me to provide for my children and the junior syndicate! The children spoke about paella for days afterwards and told me how much they liked it! I could never by myself have given them such as rich experience as what you helped me to do. Our giant 200+ Person Pan was in action at their school fair. "A Massive thankyou for your support for the school on Sunday. It has been great having all your advice, support, knowledge and guidance with the event. Thank you. We thoroughly enjoyed the challenge and of course eating the paella too. We had heaps of comments and lots of people said what a cool idea the concept was. The banner was a winner as were the shirts, the girls looked really smart". Our equipment was provided to help them with a fundraiser - we even helped with the cooking! "What a fantastic service to use as part of a fundraising event! Sweet Louise is a charitable organisation that helps women living with secondary breast cancer and I held a 'Paella' evening to raise funds for Sweet Louise. The food was amazing, Sally and Jose were wonderful chefs and the actual cooking of the Paella is an event all on its own. I couldn't recommend this more highly as a great and sociable way of bringing people together and helping to raise money at the same time - Sue Brewster, CEO"
Our equipment was provided to help them with this event, which was organised by the members of the Auckland's Hispanic Club, who do so much to promote the Spanish Culture in Auckland.